This article is the seventh in an ongoing series detailing utility pole issues and the steps it takes to remedy them. Today, we discuss a problem that can be expensive to ignore, but surprisingly low-cost to remedy: left-behind J-hooks, P-hooks and anchors. Small relative to the size of a power pole and most equipment hanging on it, are numerous, j-hooks, p-hooks and anchors, which are functionally important, but often forgotten. When equipment is removed or relocated, lack of attention to detail can result in orphan J-hooks or P-hooks cluttering a pole’s surface. Anchors are also easily forgotten when guy wires are removed, relocated, or otherwise eliminated. Nature can also be the enemy of the clean and orderly utility pole. If equipment is damaged or torn away from its moorings by wind or other natural forces, J-hooks or P-hooks may remain. Equally, traffic accidents have a tendency to take out guy wires and pole supports, leaving anchors hiding in grassy areas and on sidewalks, where they can be a public safety concern. As with many joint use issues, knowing is half the battle. Conducting a utility pole inspection gives pole owners the ability to quantify and qualify exactly what was left behind and unused in the field—as well as the ability to correct the issue—before an anchor becomes a trip-and-fall danger or a J-hook or P-hook remains on the pole and is billed as a fully functioning attachment. In addition, employing an intuitive, online joint use management system can keep the problem at bay, as this type of solution gives owners easy access to field inventory data, and provides clear avenues of communication with attachers and internal maintenance crews. So when left-over equipment is found, it can be located and removed with efficiency. Unsure what you need from joint use management software? Check out our quick list of must haves when choosing a joint use solution. Two reasons: safety and cost-effectiveness in infrastructure asset management. 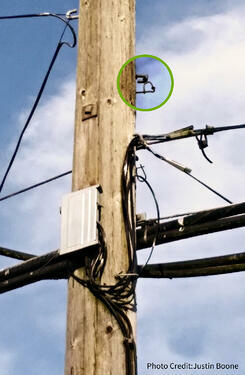 Safety: For utility pole owners, abandoned anchors pose tripping hazards and constitute a public safety issue. While poles themselves are easily visible, stripped of connecting guy wires and reflective sheaths, anchors hidden in the grass or poking out of sidewalks can become unwelcome obstacles to walkers, joggers, strollers, bicycles and even tire puncture dangers for vehicles rolling off the beaten path. Cost: For attaching companies, neglecting to remove J-hooks, P-hooks or anchors at the time equipment is removed or relocated can result in excess spending on ghost attachments. Companies may continue to be charged for an attachment on the pole, as it would be considered “abandoned plant,” even though the bulk of the equipment had been removed. The bottom line: Getting out into the field and assessing the state of your assets through an inspection can pay dividends in safety and cost effectiveness.